Crispy brussels sprouts carmelized with maple syrup and studded with hazelnuts. These ain’t your mama’s brussels sprouts! No offence to your mother’s cooking. I’m sure she’s a fantastic chef. But even the most fantastic chef is limited by the ingredients available to them. I don’t know about you, but as a kid, the only type of brussels sprouts I ever laid eyes on were found in the frozen aisle of the grocery store. When those things were heated up they just turned into a mushy pile of bitter sadness. Enter fresh brussels sprouts. These are a whole different ballpark. They ought not to even be permitted to share the same name as the frozen stuff! When these are roasted the edges get delightfully crispy. The centers soak up the flavouring sauce. It’s an explosion of flavour in your mouth with no hint of bitterness whatsoever! They’re truly heaven on earth in food form. 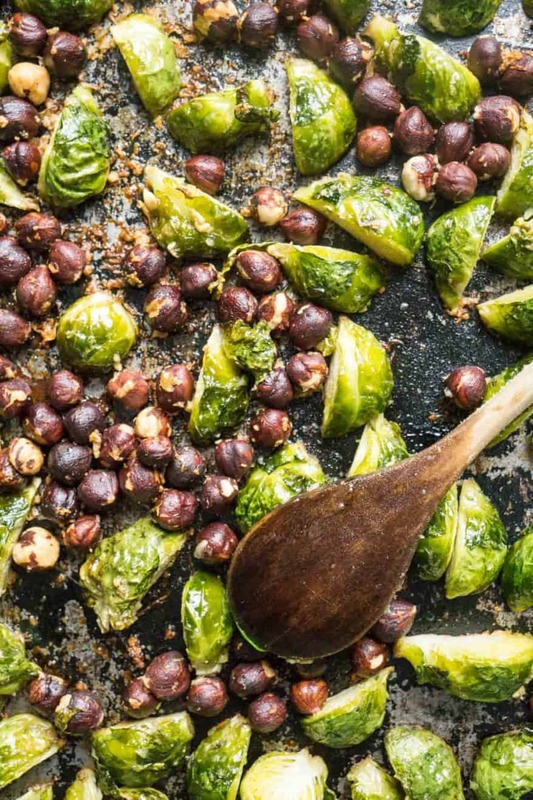 When we were visiting in New York this past fall, Jeremy’s sister made some incredible brusselS sprouts and hazelnuts. Until this point I had been adding pecans to my brussels sprouts like a complete fool. 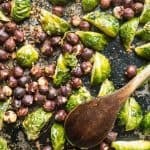 Sure, pecans and brusselS sprouts taste good together but hazelnuts and brussels sprouts were simply made for each other! So what did I do when we got home? I copied her, of course! And this recipe was born. side dish or main dish? you decide. This recipe makes a fantastic side dish. It also make a mean supper. When I created this recipe I intended on the brussels sprouts being eaten as a side dish. However they were so delicious I wanted nothing to do with the main dish I had also prepared that day. 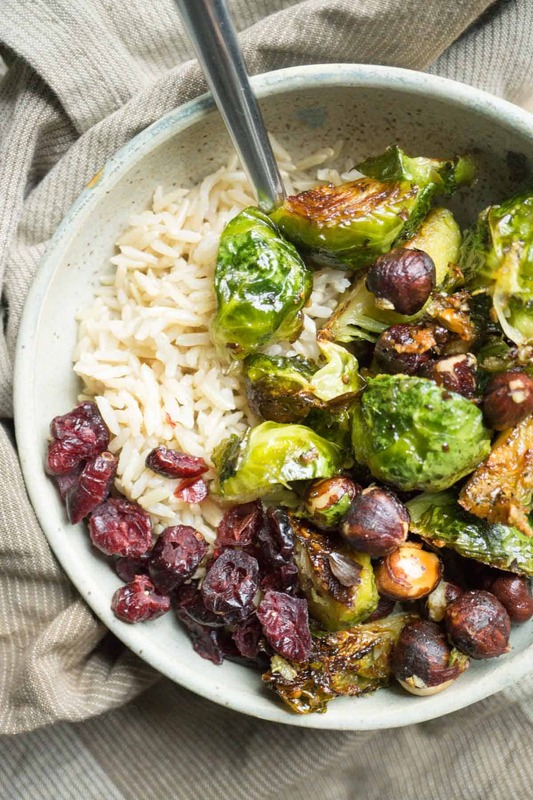 I found some leftover brown rice in the fridge, tossed the brussels sprouts on, sprinkled with some dried cranberries and this has not become our new favourite meal! 1478 ug lutein and zeaxanthin…. phytonutrients that have been shown to keep the eyes functioning properly! All in all, brussels sprouts give you a well-rounded amount of SEVERAL key nutrients! 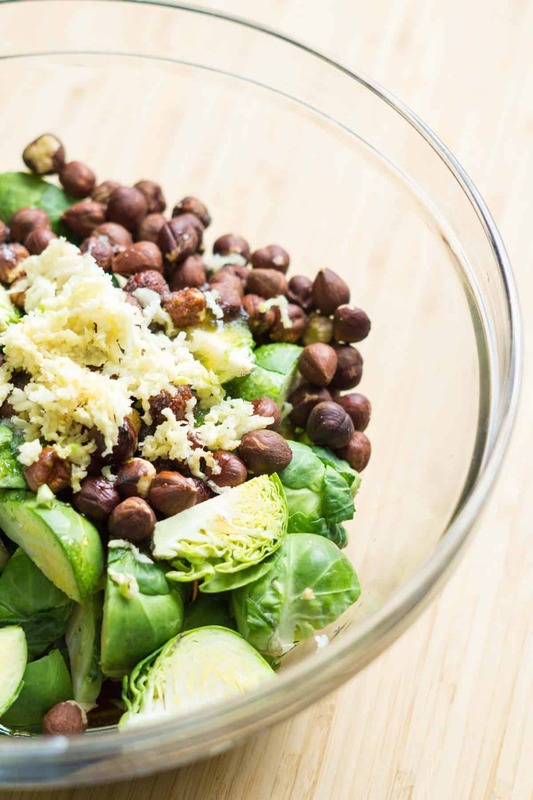 The hazelnuts compliment the brussels sprouts nutritionally and provide a good amount of healthy fats, magnesium, zinc, iron, and Vitamin E.
Measure all ingredients into a medium sized bowl. Spread in a single layer on a rimmed sheet pan. Flip the brussel sprouts over so that they are all cut side down on the pan. Bake for 15-20 minutes. They will be ready when the bottoms turn a golden brown. Watch carefully towards the end because there is a fine line between done and burnt! They taste best fresh out of the oven while the edges are still crispy. But, they’re still good later on too. I love Brussels sprouts so I am definitely going to try this. It looks delicious! !